Washington, DC ---The Smithsonian’s National Zoo is a buzz with its new pollinator-themed playground: Me and the Bee. 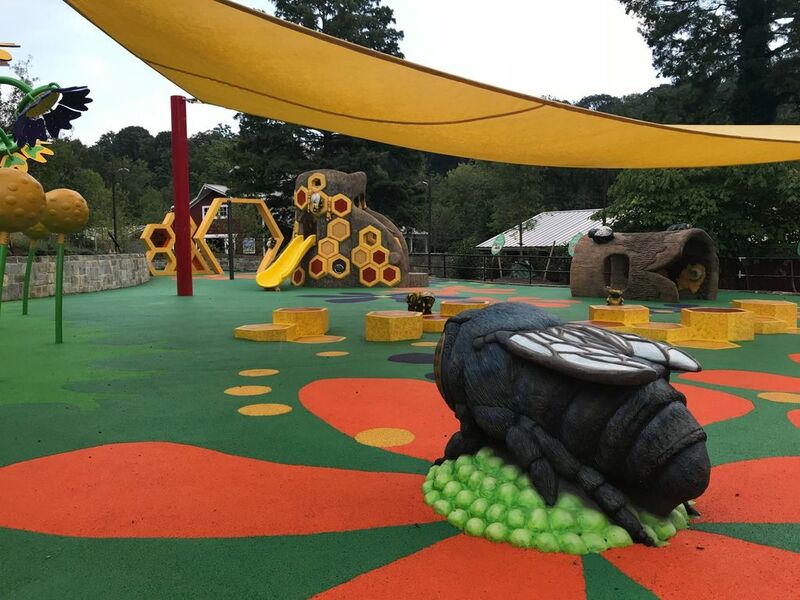 Designed to spark curiosity and imagination, Me and the Bee GameTime PlayWorx inclusive playground encompasses 4,900 sq. ft. of space where children can play and learn all about bees. Children will discover towering flowers, hop along particles of pollen, climb atop honeycomb steps, crawl inside hollow trees the bees call home and slide down a tree stump dripping with thick golden honey. Zoo visitors will “shrink” to the size of a bee and step through a honeycomb to discover larger-than-life-sized figures of European honeybees and blue orchard mason bees. The poured-in-place rubber play surfacing includes yellow pollen particles, which children can follow from decorative flowers to the bees’ hives. Adding to the dramatic play experience are two interactive sound projectors; children can turn a rotary crank to hear a group of buzzing bees or push a button to hear a variety of pollinators, including hummingbirds, bats and insects. Honeycomb steppers—platforms for climbing, jumping and resting—are painted to mimic cells filled with pollen and honey. Leaf-shaped signage around the playground tells the story of pollination from the hive to the table. Visiting Me and the Bee playground is a fun, exciting educational experience for the entire family. Learn the story of pollination, from bee to food production, and find out how you can help protect bees in your own backyard! Click here to see more images of this playground.